A little while ago I dyed some silk caps, spun and knitted a beautiful bookmark. The spinning wasn't very neat but I certainly was chuffed with the result. So moving on from that, and having another... er... opportunity to dye some fibre using my hair dye, this time I grabbed some silk roving. This will give me a neater result than caps and has taken the dye really well. A bit too well. I tried to get a variegated effect with some areas untouched by the dye, but it crept through all of the fibre in the rinse water and has stuck. There's still some variation, so I'm very happy with this. 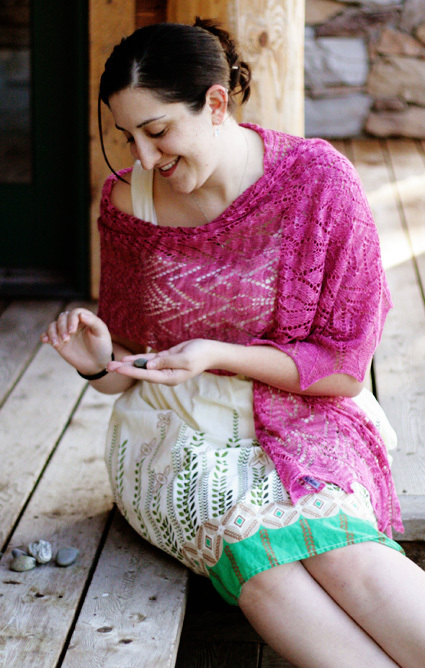 By coincidence I noticed some beautiful shawl patterns yesterday in the current Knittyspin. 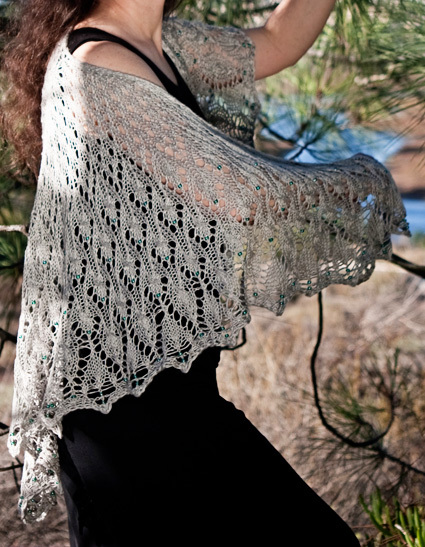 With my current shawl project very nearly finished, and feeling dead pleased with it, this might be my next big project. The purple one is 100% silk, but I think I prefer the pattern for the top (beaded) one.